Why should you—and can you—grow Aloe vera? It’s arguably the most commercially grown succulent (followed by the tequila agave and supermarket kalanchoe). The medicinal and cosmetic value of the plant’s gel-filled leaves have been recognized for millennia, and it is reputed to have been part of Cleopatra’s beauty regimen. Google “Aloe vera” and you’ll get dozens of hits for products that use the gel in topical skin lotions or as a food ingredient. Studies of the plant’s effectiveness for a wide range of ailments tend to be inconclusive, but no one questions the efficacy of Aloe vera at soothing minor burns. And because of its antimicrobial properties, it’s supposedly better than toothpaste at preventing cavities. But would you want to ingest the raw gel? It won’t hurt you (in small quantities) but it’s awfully bitter. Mixing it with honey and water is an option if you really want to take it internally, but don’t overdo it; it has laxative qualities. In the garden, it serves as a nice (if not especially showy), midsized, low-water succulent. 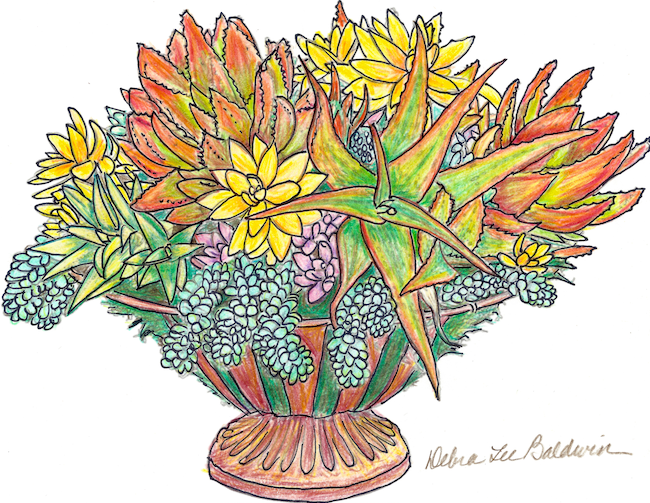 Instead of orange flowers typical of most aloes, those of Aloe vera are yellow. Its leaves are tapered, upright, gray-green, and grow to about waist-height. The plant is also colony-forming over time. I grow Aloe vera mainly to have it on hand in case of sunburn. Slice a leaf lengthwise and rub the goo on your skin for soothing, instant relief. See my latest YouTube video: How to Harvest Aloe Vera Gel. Aloe vera plants are available at large nurseries and garden centers and will thrive outdoors if protected from frost and desert heat. Like most succulents, Aloe vera needs plenty of sun, weekly watering, and soil that drains well. It also makes a good windowsill plant, although it is unlikely to bloom indoors. Btw, Aloe arborescens—a popular landscape succulent—offers the same benefits as less common Aloe vera. Announcing My New Succulent Coloring Book! I’m proud and pleased to announce the release of my latest book: “Sensational Succulents, an adult coloring book of amazing shapes and magical patterns” published by Timber Press. The line drawings, based on my photos, are by illustrator Laura Serra. Succulents beautifully illustrate nature’s artistry. By immersing yourself in the patterns and geometry of succulents, you’ll discover yet another reason to enjoy the plants, and gain greater insight into why you love gardens and gardening. All photos used for the coloring book are on my website so you can refer to them, if you like, when selecting which colors to use. I used the line drawing of Graptoveria ‘Fred Ives’ from the book and the photo that inspired (shown above) it to paint the watercolor I’m holding below. I also made a 4-minute video that shows how I traced the image onto watercolor paper, masked white areas of the photo, applied washes, and painted one leaf at a time by dropping in dabs of color. Adult coloring books are popular because they offer hours of stress-relieving, creative fun. Sensational Succulents is filled with a huge array of plants that inherently have geometric patterns—in fact, succulents are known for them. Illustrations appear on only one side of a high-quality paper that supports a variety of mediums, including pencils and markers. I hope you’ll discover the relaxing pleasure of coloring via my new book. I used colored pencils for this one. The book’s page on my website has the line drawing for the same image, which you’re welcome to download. https://debraleebaldwin.com/wp-content/uploads/2016/04/Urn-arrangement_resized.png 503 650 Debra http://debraleebaldwin.com/wp-content/uploads/2015/04/Logo-White-H200px.png Debra2016-05-06 21:21:262018-12-13 13:46:35Announcing My New Succulent Coloring Book! I’m so pleased with designs created by students in my online class, Stunning Succulent Arrangements! 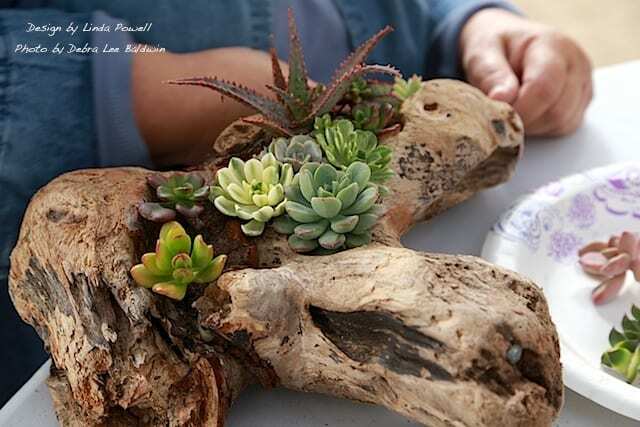 During the 7-lesson class, I explain succulent varieties, care and propagation; and show how to make wreaths, terrariums, floral-style arrangements, a succulent color wheel and more. Craftsy’s student-oriented approach allows you to take the class anywhere and anytime; pause, rewind and restart at your convenience; view my answers to questions and ask your own; and share projects you’ve made. Access never expires. Want to join my Craftsy community? Enroll now for half price—$20. To film the class, Craftsy—the leading purveyor of online how-to instruction—sent a 3-person crew from their headquarters in Denver to my home near San Diego. They brought enough high-tech equipment to fill a spare bedroom. We spent three intense days filming. Make a succulent mug gift bouquet the next time you need a little something for a friend or hostess. This transcends the traditional flower-stand bouquet and has utility long afterwards. Mugs sold individually at home goods stores and secondhand shops make great gifts, especially when filled with succulent rosettes that suggest exotic flowers. Succulents wired onto faux stems are long lasting and can themselves be planted later as cuttings. I prefer to use a mug of my own design (available online from my Zazzle store), but any nice one will do. …sand for ballast (so the stems stay upright), 22-gauge floral wire, stretchy green floral tape, garden snippers, and wire cutters. 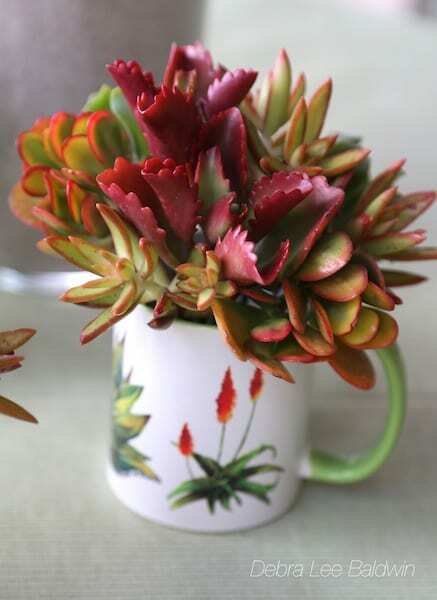 See each step in my recent video: How to Make a Succulent Mug Bouquet. Also check out my post on how to make A Succulent Bouquet in Colored Sand. 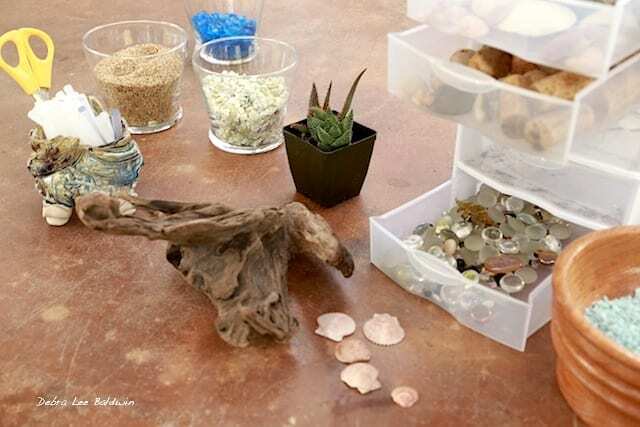 It features wired succulent rosettes in a glass containers filled with layers of sand. For how to make a wedding or other special occasion succulent bouquet, see my book, Succulents Simplified, pages 162-169. One of seven sessions of my Craftsy class, Stunning Succulent Arrangements, is How to Make a Succulent Bouquet. Use this link to take the entire class (all seven lessons) at 50% of the regular enrollment price—$20 instead of $40. 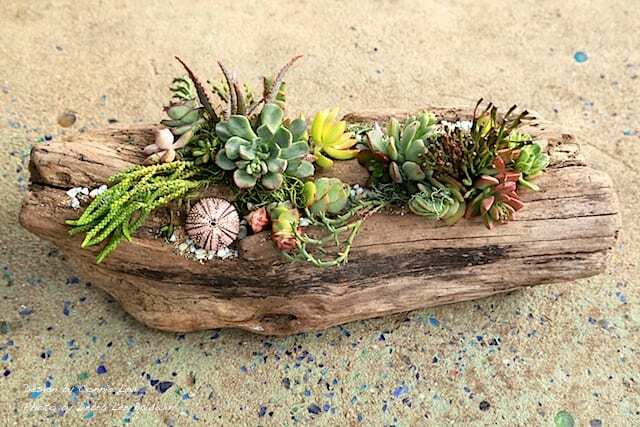 When you make succulent driftwood designs, the plants resemble undersea flora, and the wood hints at something you’d see washed up on the beach. The two combine to make a special, almost fantasy-like composition that works well as a patio centerpiece or special gift for a friend. 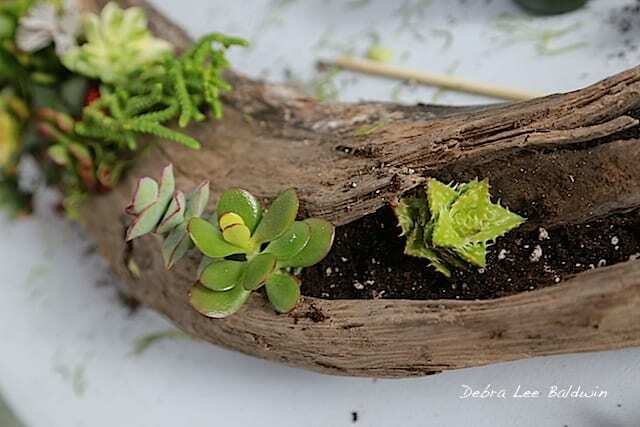 These photos are from a recent succulents-and-driftwood workshop. Driftwood pieces (from Sea Foam Driftwood) come with pre-drilled crevices for potting. 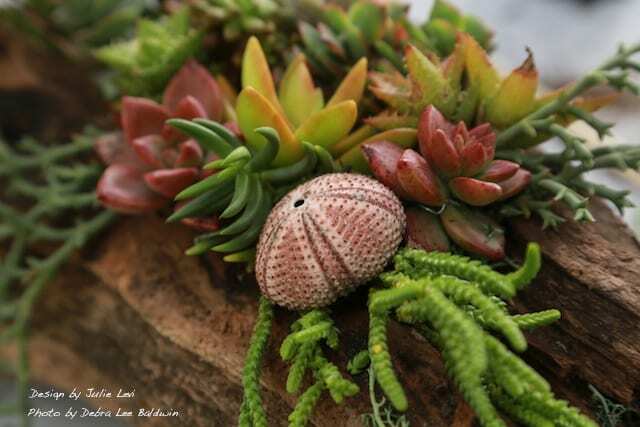 Materials include small potted succulents, cuttings, sea shells, bits of tumbled glass, moss, rocks and sand. Tools are clippers, hot glue, and a chopstick for tucking-in plants and settling roots. Begin by filling the planting hole with potting soil. 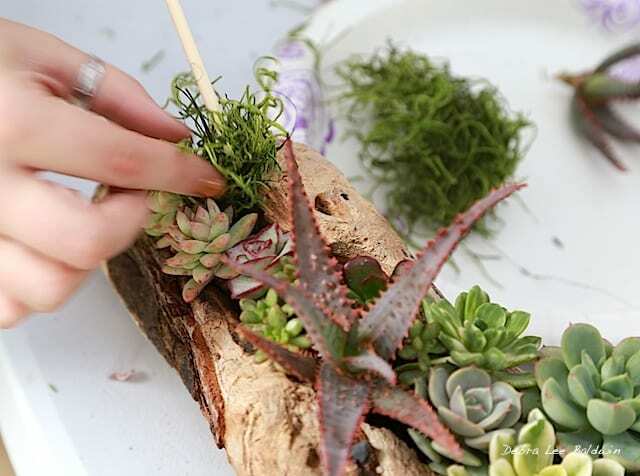 Add small rooted succulents and cuttings, envisioning them as undersea flora and fauna growing in and on submerged logs. Use a chopstick to tuck floral moss into remaining gaps. Moss will conceal any exposed soil and help hold cuttings in place until they root. 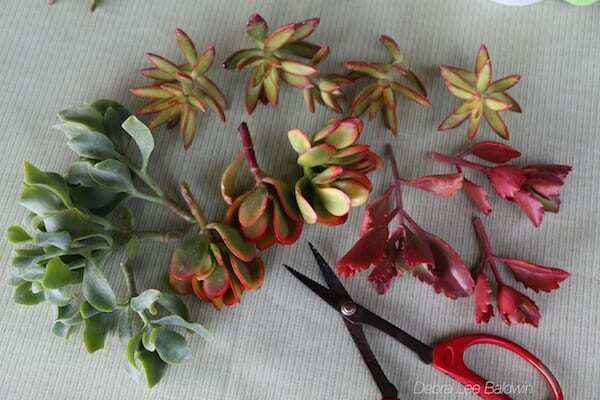 Cuttings selected by Julie Levi include trailers (Ruschia perfoliata, Crassula lycopodioides), colorful rosettes (Sedum nussbaumerianum and Graptosedum ‘California Sunset’), and Crassula tetragona, among others. A sea urchin shell, attached with hot glue, is the perfect finishing touch. Connie Levi chose a slightly different assortment: Crassula lycopodioides (watch-chain crassula), a dwarf aloe, Aeonium haworthii, Crassula perforata ‘Variegata’ (a stacked crassula), and for upright interest (at right), Hatiora salicornioides. 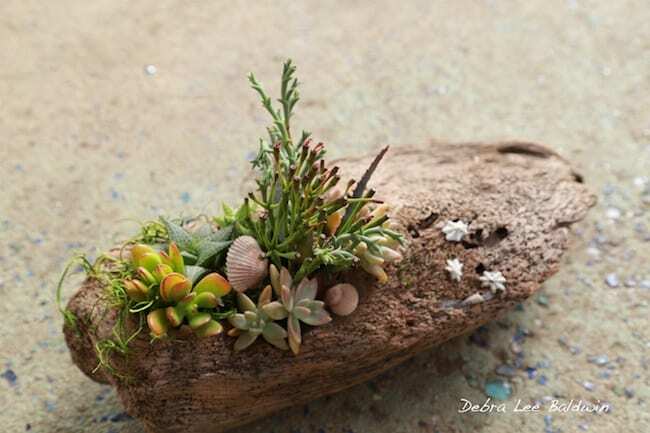 Linda Powell filled her piece of driftwood with pieces of jade, Kalanchoe pumila, variegated aeoniums, an echeveria, a dwarf aloe that resembles a sea star, and dainty cremnosedum rosettes. I like how she clustered smaller shells, too. Libbi Salvo’s long piece of driftwood, with several areas for planting, would make a good centerpiece for a rectangular outdoor table. On Garden Gossip Radio (AM 1290 KZSB), Lisa Cullen and I talked about decorating succulents for the holidays, and how to decorate WITH succulents as well. This post illustrates several of the topics and gives links to more in-depth descriptions. The link to the full interview can be found below! Turn your agaves into an explosion of festive color with glass ball ornaments. Agaves can be a bit treacherous, so be careful, but the risk is worth the reward! Crassula tetragona is a type of jade that looks like a pine tree. For a lovely hostess gift, make a succulent bouquet with a dozen rosette succulents, floral wire and tape, and a simple ballast such as sand. Perfect for holiday parties! 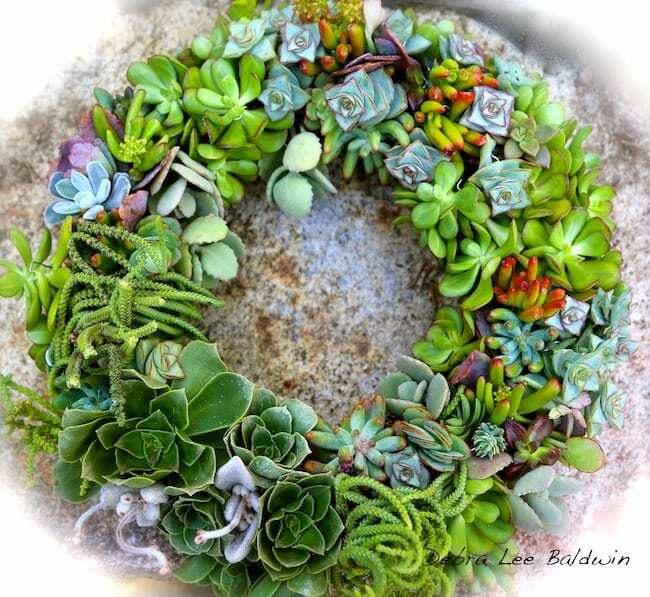 What’s the secret to a great succulent wreath? Color! 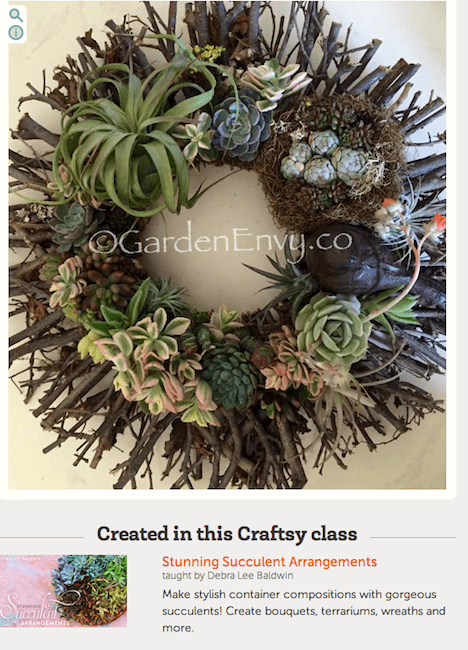 My recent blog post on Katie Christensen’s Succulent Wreath Class has lovely photographs and a ton of ideas to choose from. Don’t miss it! In this video, I discuss how to make a succulent topped pumpkin with San Diego garden designer Laura Eubanks. With over 10,000 views on YouTube this video is a treat and, for all you DIYers, easy to follow. Use this technique to add succulents to anything from pine cone ornaments to napkin rings. Special thanks to Chris and Lisa Cullen from Garden Gossip Radio for having me on the show!